Census records are some of America’s most historical documents—and one of the finest set of documents available to you in your research. They include your ancestors’ names, and lots of personal data about them and their families, and have been taken every 10 years since 1790. 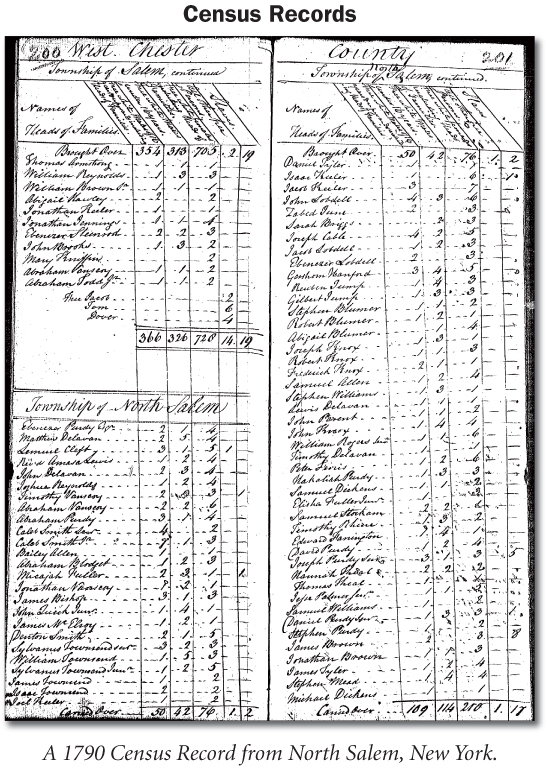 From 1790 to 1840, the census records list only the names of the heads of households. After 1850, the name of every person, rich or poor, propertied or landless was written down (at least in theory). 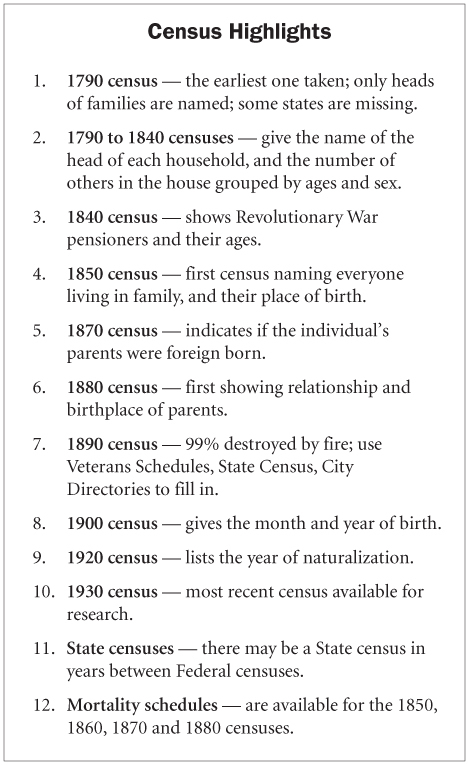 These census lists are also called schedules. A well-indexed census is one of the easiest ways to locate exactly where your ancestors lived and identify the dates they lived there. You also find excellent family information, particularly in more recent censuses. The biggest breakthrough in census research has been the posting of census indexes and images on the Internet. Presently almost all census schedules are available on the Internet or on microfilm, up to the year 1930. The only exception is the 1890 census, the majority of which was destroyed in a fire. Census records are organized geographically—by state, then by county, then by city or township. For manual searching of larger cities, you will find it easier to locate an ancestor if you have the person’s address. In rural areas, knowing the township in which the person lived is sufficient. To organize their work and avoid duplication, census workers divided the area to be counted into districts. The term subdivision was used in early censuses to refer to a supervisor’s or marshall’s district (a city’s census districts followed ward or precinct boundaries). Beginning in 1880 and afterwards, these districts were called enumeration districts (E.D.). The lines of these districts typically followed city ward or precinct boundaries, and in rural areas generally following township lines. Population schedules give a “snapshot” of your ancestor’s family on the census day and list where they were living. Federal censuses from 1790 to 1840 list the names of heads of households (and age categories for others), but don’t give names of other persons living in the household. Census records from 1850 on show the names of each member of the household and give his or her age, state or country of birth, marital status, occupation, and race. Naturalization and immigration information is included in the 1870, 1900, 1910, 1920, and 1930 censuses. These records can also give clues to number of years married (1900 to1910), death dates (in mortality schedules, 1850 to 1880), previous residences, adoptions, and divorces. 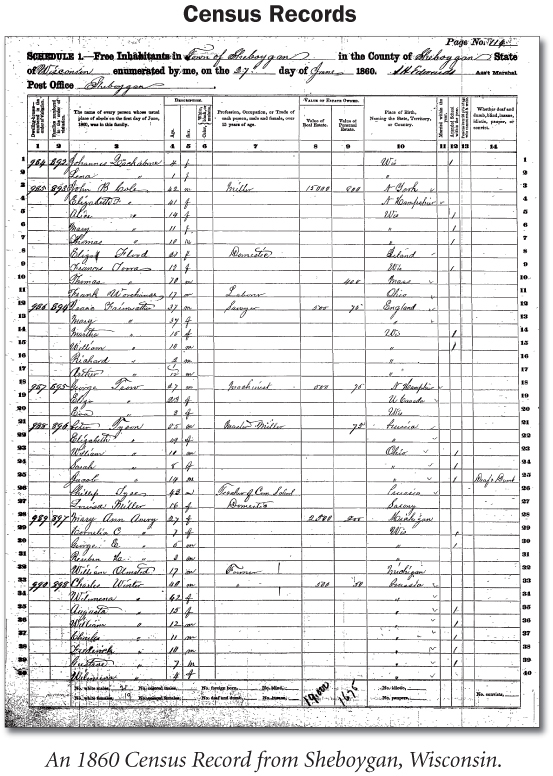 Parents or other relatives may have been living with a family when a census was taken. Mortality schedules exist for 1850, 1860, 1870, and 1880. They list persons who died during the 12 months before the census was taken. Mortality schedules include a person’s name, age, race, marital status, state or country of birth, month of death, and occupation. The names are recorded alphabetically by county, city, precinct, and district. In the 1840 federal census, a listing was made of Revolutionary War veterans that included the age of the veteran, the place where he was living, and the name of the head of the household. The 1890 census includes a List of Union Civil War veterans or their widows. So, if a child was born June 2, 1850, he wouldn’t be included in the 1850 Census, even though he was born before the census taker arrived at the home. TIP: Locate your ancestor in every census taken during his or her lifetime. This comprehensive approach is not only good research procedure, but it may result in finding extended family members living with your ancestor, even “new” relatives you were not aware of. Don’t skip census years. Trace your ancestors methodically in each census in reverse chronological order. 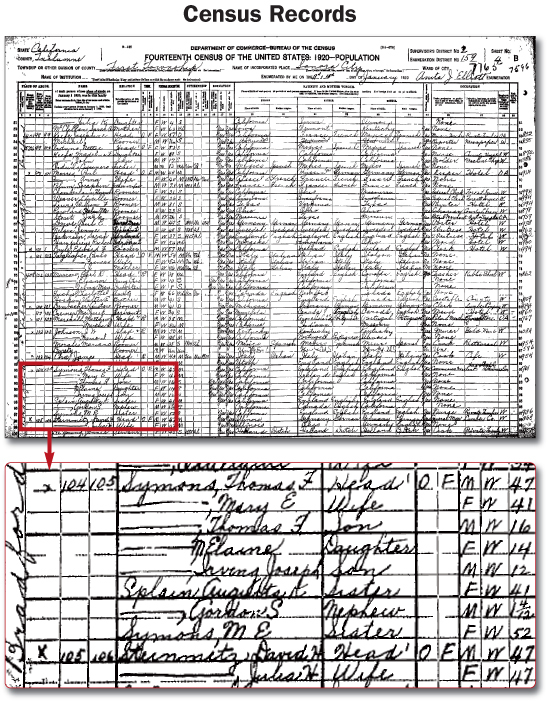 TIP: Record all the information in your ancestor’s census entry (including the source information). Recording this information now will save you time and frustration later when you probably will need to look for it again. It’s amazing how often you will refer back to the same census as you discover your ancestor married one of the neighbors, or you can’t find your Sally Jones because she married John Smith and is living two farms from her parents, but you didn’t know this at the time you did the original extraction. TIP: Copy everyone listed in the household where you find your ancestor (unless it is a rooming house or hotel). Why? Because there is an excellent possibility these people will turn out to be related — somehow. Minor children found in a household with a different surname almost invariably are related to the head of the household. TIP: Pay attention (or even record) the names of the neighbors who appear on the pages before and after the page where you ancestor appears. Among these will usually be other family members, as our ancestors seldom moved to an area alone. Write down the 10 families listed on either side of your ancestor’s name on the census sheet. Our grandparents often married their neighbors. What appears at first glance to be a neighbor sharing nothing more than an enumeration district could end up being a grandparent. Courting long distance is tough to do in any circumstance during any period of time, but to ride miles on horseback—or worse, walk on foot—as our grandfathers would have done, would dissuade even the most amorous of lovers. TIP: Don’t be too concerned about age or other discrepancies. As you follow your families through several censuses, the ages will be fairly accurate. However, remember, census takers were not always concerned with accuracy, either for names or for dates. Information on census records should be confirmed with other sources. TIP: Consider all possible spelling variations of your names. Spelling and handwriting often make reading these old census records difficult. Be sure to consider all possible spelling variants. Capital T’s, L’s and S’s are often interchanged as are lower case n’s and u’s or a’s, u’s and o’s. Even entire names can be misread. Consider all possible phonetic spellings of your surnames. The letters H and E are commonly dropped or added. Think about the regional accents and sound out how a surname may have been heard by an enumerator. If your surname begins with a vowel, be especially alert to another spelling. For example, Ingle may have been recorded as Engle or Angle. TIP: When using an index, click on the “Soundex” option (if available) to search multiple spellings at the same time. You can, for example, search Gould and Goold without entering each different spelling. TIP: When viewing census images on the Internet, your ancestor is often found on the “next” page. Oftentimes, you’ll find your ancestor in the index, but when you double-click on his name to see the actual census image, you won’t find him on the page that comes up. If this happens, simply click “next page” (to bring up the image of the next page) and you’ll usually find him listed there. If you’re pretty sure they were in a specific location, search the actual census itself. In large cities, learn your ancestor’s address by searching the city directory for the same year as the census. Then determine which enumeration district that address is in on the original census schedules. TIP: Remember, the online Internet census indexes (except for 1880 & 1930 censuses) are indexes to the heads of households only. They don’t list every single person included in the census. if you have a pretty good idea of the location where the family was living, then do a search of all families with that surname in the county. You can then sort them by township location and check the census image for each family to see if they’re your family. TIP: Don’t assume that any or all of the information in the census records is correct. The enumerator may have asked the neighbors. Your ancestor may not have spoken English well, or at all, or could have misunderstood various questions. And, the math skills of many of the census takers was poor, to say the least. Verify all census information with other records. TIP: Don’t assume the children belong to the couple they are enumerated with (unless relationships are specified). They may be nieces and nephews, grandchildren, or even unrelated. Enumerators often got carried away with the ditto marks. TIP: Don’t assume the children are those of the wife listed. They may be, but often are not. Men have been known to re-marry women with same given name. Always search for marriage records. Re-marriage was frequent as many women died in childbirth, leaving the father with young children to care for. The solution was to find a wife—and quickly. TIP: Don’t assume that all the people listed in the families on the 1790 to 1840 censuses are related. They could have been farmhands or miscellaneous relatives living with the family. Often several families resided together. TIP: Don’t assume when a head-of-household is no longer enumerated with the family that he or she is dead. The “old folks” may have gone to live with a son or daughter. Always search for them in the homes of their children. TIP: Don’t assume a person was still living at the time of the census. The enumerator was instructed to take down the names of the family as it was composed on the official date of the census, not the day of the visit. TIP: Don’t assume that, if your ancestor is not listed in the index, he’s not in the census. Use indexes and soundexes with caution. There are errors and omissions in all of them. If you know (or strongly suspect) your family was living in a particular county, try several different name spelling variations—or read the entire census for that locality.